I thought I’d move away from Valentine’s Day gifts today… don’t worry, I’ll have more tomorrow. I thought I’d focus on the women who have munchkins that still want to show their love for Disney but need to have certain items with them. Sometimes a normal tote bag just doesn’t cut it when you have an infant or a toddler. Today’s Disney discovery allows that mom to show her Disney side, be fashionable and stay organized! 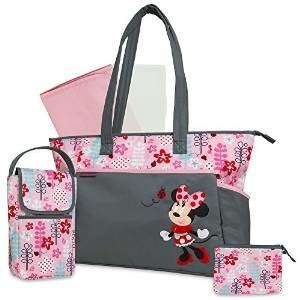 Let’s take a look at the Minnie Mouse 5 in 1 diaper bag! This diaper bag combines one of my favorite color combos… pink and gray. I think this bag is definitely super girlie so that man in your life may not want to tote it around but this one is for the Minnie lovers! Minnie is front and center, all adorable, and the pink floral pattern is lovely. This bag comes with all kinds of extras like the bottle holder, wipes case and changing pad. All of these are matching and color coordinated, of course. One aspect I personally love is that it has a zippered top. I am always afraid of things falling out or people trying to steal things (I may be a tiny bit paranoid) but this helps make me feel secure. This bag is perfect for a baby shower, Disney loving mother or even as a tote bag for any Minnie Mouse loving female! You don’t have to use the accessories for what they say. You could leave them out altogether if you wanted! This bag is on sale for $29.59 and has free shipping for purchases over $35. If this bag looks like it should be yours, check it out here! 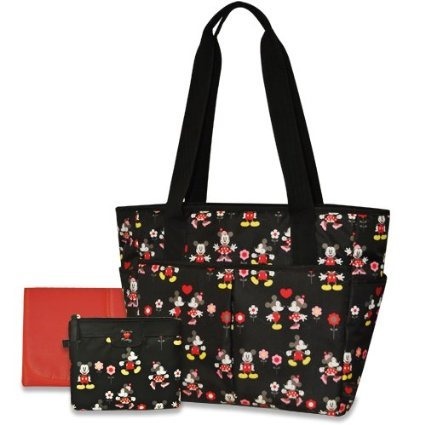 Now for those of you who want a Disney bag that’s a little less girlie, so perhaps that Disney loving husband will also use it, I bring you the Mickey and Minnie Tote. This tote has both of our fave mice frolicking around and it includes a changing pad and matching pouch. This could also be used as just an every day tote for the non parentals out there because it is that versatile. The black bag makes it less noticeable if and when it gets dirty which might also be a plus for some. This bag is also on sale and it is $19.92 from $29.99. If this one is more up your alley, check it out here. That’s it for today’s Disney discovery! Happy shopping ,everyone! Now why didn’t they have cute Disney diaper bags like this when my kids were little. Will make a great baby shower gift for my cousin though.